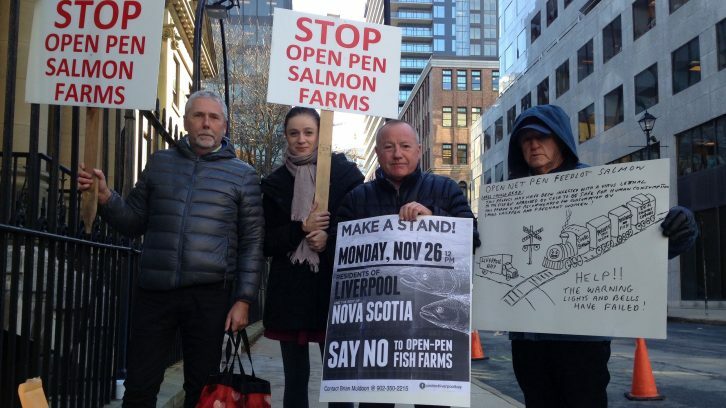 As Cooke Aquaculture looks to expand its fish farming in Liverpool Bay, residents who oppose the project say the company is ignoring their concerns. In September, the Nova Scotia government granted Kelly Cove Salmon, a subsidiary of Cooke Aquaculture, permission to look at new sites in the bay. The company has operated one site in the area since 2011, which employs 10 people. Those opposed to the expansion have a number of concerns, including fish-waste pollution, the possibility of cage failures, the use of pesticides to control sea lice and potential negative impacts on sea creatures, like lobster. “It’s all bad. It’s an environmental and fisheries disaster, wherever they go,” said Fred Giffin, one of the protesters outside Province House on Nov. 26. About 100 people attended a similar demonstration in Liverpool that day. Giffin said he’s concerned with the company’s track record, including the use of illegal pesticides, diseased salmon, damaged cages and fish escapes. Kim Masland, MLA for Queens County and a Liverpool resident, said the majority of constituents she’s spoken with have made their concerns clear. “They’re looking at this expansion more as a threat, not an opportunity,” she said. Residents are also worried about the economic impact on tourism and real estate, she said, pointing to a study from the Université Sainte-Anne outlining the environmental, economical and social concerns of local fishermen. Joel Richardson, vice-president of public relations for Cooke, said it’s too early to say how large the expansion might be. However, he said, the company is working with researchers, scientists and other marine professionals to determine the best location for any additional fish farms. Cooke recently acquired a new vessel that treats fish for sea lice, without chemicals, by running them through through warm water, Richardson said. He also said treatments used by the company to control parasites are consistent with large-scale agricultural producers. If the company submits an application to the province for new sites, it will be in the new year. After the application is submitted, it must be reviewed by the Nova Scotia Aquaculture Review Board. “The work that we’re doing now, gathering feedback from the community and doing our own due diligence, looking at the research and science behind the potential siting, it’s just part of that process,” Richardson said. On Oct. 30, 174 people attended an open house-style meeting held by Cooke for residents to learn more about the project. Giffin said the company failed to answer questions or address concerns from community members. “It’s just like beating your head against the wall,” he said. Richardson said residents can submit questions and concerns through a corporate website, noting that there’s only been a few submissions. All feedback will be forwarded to the review committee, which will hold an adjudicative hearing once Cooke completes the scoping process. Shortly before the hearing, members of the public will be allowed to submit written comments to the board for consideration. Aquaculture regulations implemented in 2015 require applicants to conduct a scoping process, which is meant to facilitate communication and information-sharing between the company, the public and the regulatory board. As part of that process, Cooke is required to hold a public information session and to collect public input for submission to the review board. Under the regulations, it is unclear whether the findings of the scoping process will be made public once submitted to the Aquaculture Review Board. In an interview with The Signal on Dec. 4, Fisheries and Aquaculture Minister Keith Colwell said while Cooke is not obligated to publicly release the findings of the scoping process, they will be discussed during the hearing, which will be recorded and open to the public. Community members with specific complaints or concerns may make oral or written submissions to the review board at that time. Masland believes a lack of transparency causes a breach of trust between residents, the provincial government and Cooke. “If we’re going to ask communities to be a host community of these farms, we need to make sure the information, all of the information, is coming back to the people and that the people who live in the county have an option to make a decision,” she said. Editor's Note: The comment from the aquaculture minister was added after this story was first published. Thanks so much to Stacey Steward for this excellent coverage. She gave me about a half hour to rant from my soapbox. This industry worldwide, not just Cooke, but Norwegian giant Marine Harvest is wreaking havoc not only in Canada, mostly in BC, but much worse in Chile. Another Norwegian Company Grieg Seafoods is about to begin construction of the largest open net pen feedlot in Canada in Placentia Bay with a multi-million dollar incentive from the NL government. This is certain to bring about irreversible damage to wild Atlantic salmon and all the other negative environmental damage associated with the industry. I would encourage everyone to view the documentaries Salmon Confidential by Alexandra Morton of B.C., which exposes Marine Harvest , the federal DFO and CFIA, Salmon Wars by Silver Donald Cameron which exposes Cooke and collusion with Nova Scotia government, and Salmonopoly, the most disgusting exposure of the criminal activities of Marine Harvest. Minister of Fisheries Keith Colwell has consistency told the community members that he will only ever listen to the “facts” but it has been proven over and over again the “facts” are irrelevant to him. There are enough studies that have been done asking that the “precautionary principle” be used when putting abnormal numbers of “farmed salmon” in cages into the habitat of wild salmon. There are enough studies that have been done to suggest that “farmed salmon” have already caused significant damage to our wild salmon populations but they have gone ignored and we are now looking at an endangered species. Keith Colwell and the Liberals are ignoring that fact. There is enough knowledge about keeping abnormal numbers of fish in feedlots developing illnesses that are deadly to wild species they are coming in contact with as well as the pesticides and antibiotics being used in the wild but Keith Colwell ignores that and in fact would like to protect Cooke Aquaculture from ever letting the public know that these illnesses and medications are being used in their public waters that wash up on their beaches and shorelines. The wild storms we experience here in Nova Scotia every winter kills and injures tens of thousands of these fish as they have no where to go to keep themselves safe but Keith Colwell considers this “business as usual” not abuse of animals. Cooke Aquaculture’s history in the communities they have forced their way into has not been a good one and their “social license” has been destroyed. The product they are selling, a fish that has been medicated and abused and is being sold often while infected with Infectious salmon anemia (because as far as they and the CFIA know it’s not harmful to humans), to consumers is not worth the pollution and dangers it present to the wild. Antibiotic resistant bacteria is now a serious threat to humans and these fish, being medicated in our open oceans are a perfect source for spreading that resistant bacteria. Keith Colwell obviously doesn’t care about that fact either. Cooke Aquaculture has been operating outside their leased areas in Nova Scotia at the majority of their sites around this province. They have been doing that since they took over small sites and decided they would just set up whatever sized farm they thought they would need to make themselves the kind of money they want, regardless of the regulations in place. This is six years later and Keith Colwell has not enforced the regulations. We don’t have a good enough government to have such a dangerous business sitting in our harbours. Thanks for the comment Kathaleen, that is very interesting thank you for the input. As usual rural communities look to shut down economic investments then cry about lack of jobs and investment in the community. When will people wake up and smell the Rose’s we need economic investment and jobs in rural n.s! Thanks for the comment Matt, that is an interesting perspective on the situation. Thanks again for the input. Open your eyes, ears and mind to the reality here. There are not enough jobs, all low paying, no taxes and all the profits go to New Brunswick in the case of Cooke and to Norway in the case of Marine Harvest and Grieg Seafoods. Go to YouTube and watch Salmon Confidential, Salmon Wars and Salmonopoly. If that doesn’t change your mind I will be shocked. Thanks for the comments Fred, and thank you for the very insightful input on this topic. “Open Pen Fin Fish Farms” do not contribute the employment stated and the cost to our environment far outweigh any contribution it brings to rural Nova Scotia. Thanks for the comment Brian, I will relay your message to the author. Also thank you for the insightful input.